Τhe small chapel of Agios Ioannis “ the Cliff” is in the south part of the island , in the area of Kapsali at an altitude of 100m . The stone stairs, approximately 130 steps, lead to the church entrance, where you’ll see the inscription of the monk Ioannikios, who restored the shrine in 1725. The church has been built in a small cave where, according to tradition, Evangelist John was hiding after he left Rome where he was persecuted and started writing the Apocalypse, before moving to Patmos. Above the arched entrance is the guest house, with two rooms and a kitchen, originally built 500 years ago. 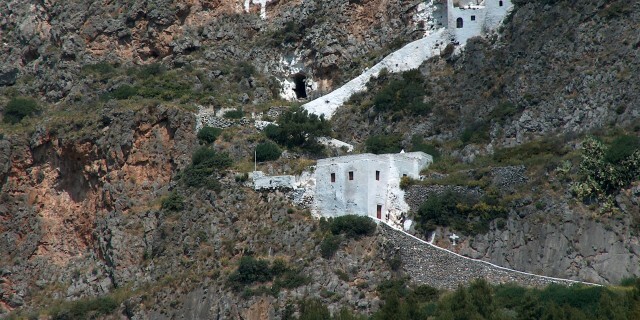 If you follow the steps further up, you will see another church , devoted to Evangelist Ioannis, and the cave. It seems that until the 17th century the complex had two churches. The one in the area of the Cave was devoted to Evangelist Ioannis, and the other one further down was named after Saint Ioannis the Baptist further down. This second one was ruined due to barbarian invasions and neglection. After this complex has been restored in the beginning of the 18th century, the church and the complex were given the name of Agios Ioannis Theologos. This area is a truly magnificent area, with excellent view of Kapsali and the Venetian Castle, and is one of the most important archeological and historic areas of Kythera. This church is open for the visitors during the summer every Tuesday and Thursday afternoon. But it will be wise to conduct first the Municipality of Kythera for further details. 24th of June and 29th of August are the dates that Agios Ioannis Theologos will be open and you will be able to be present in a ceremony.